A variety of reports are available for our practitioner account owners to monitor sales activity and payouts processed through your Fullscript dispensary. This guide will introduce you to the Account Activity & Balance Report and outline its application during tax season. 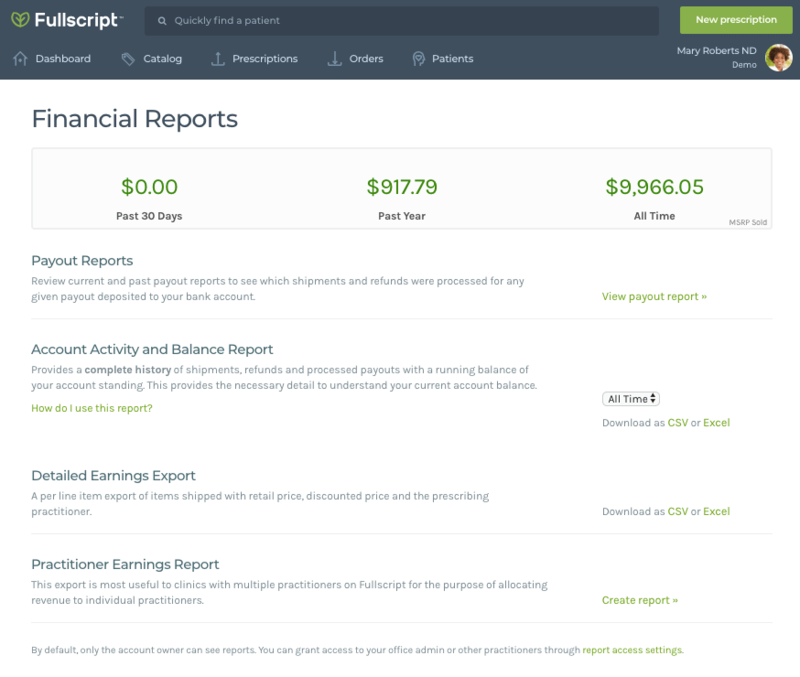 To assist in your financial record keeping, Fullscript has created financial reports to monitor sales activity and payouts. These downloads are available from Reports accessible through practitioner account owner’s accounts. If you did not qualify to receive a 1099-K, the following steps will serve as an example to assist in calculating your annual earnings. Ultimately, it is recommended that you follow the return instructions on the form you are completing. Note: A 1099-K will only be issued should the total gross volume of the store be greater than $20,000 and 200 transactions. Step 1: Download the Account Activity and Balance Report. 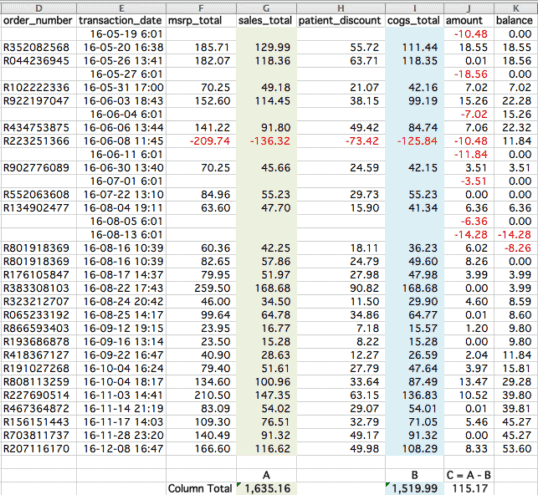 From Reports, locate the Account Activity and Balance Report, select the current year and Download as CSV or Excel file. In our example below, we will be looking into the 2016 tax year. 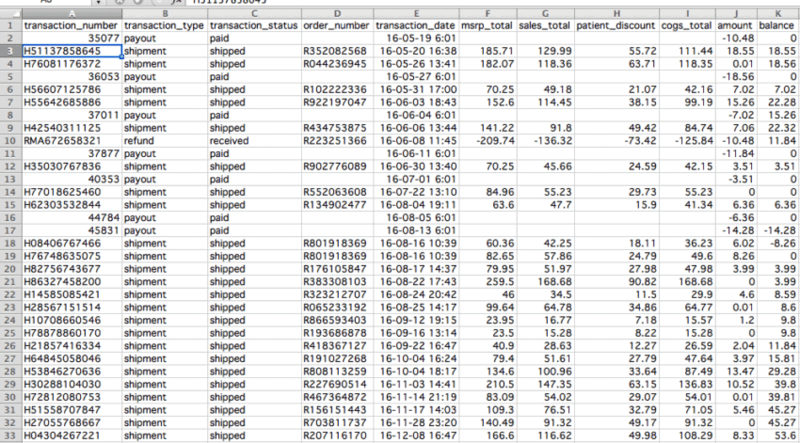 Sample CSV Export of Account Activity and Balance Report. Step 2: Calculate your Gross Sales. Gross sales represents the total retail value of orders transacted. For this, we sum up the values in the sales_total column. In this example, we see a total of $1,635.16. Note: If you are a US business and your account activity was significant enough to require a 1099-K report (greater than $20,000 Gross Sales and greater than 200 transactions), you should be referring to the 1099-K Reconciliation report as outlined in the next section when calculating Gross Sales. Additionally, the sum of annual Gross Sales should not be confused with the amount reported in box 1a of your 1099-K. Step 3: Calculate your Cost of Sales. Cost of Sales represents the cost your practice incurred to complete the sale. For this, we sum up the values in the cogs_total column. In this example we see a total of $1,519.99. Note: If you are a US business and you received a 1099-K, you can report the Cost of Sales as a reduction to your gross sales reported on that form. Step 4: Calculate your Net Income for the year. Net Income represents the total of the earnings payable to your business by Fullscript in the form of payouts. To calculate Net Income for the year, we deduct the Cost of Sales (Value B) from Gross Sales (Value A). In this example we find a Net Income of $115.17. Step 5: Report these values as needed to complete your tax obligations. Our Customer Success team is unable to provide guidance on how taxes should be reported to the IRS. Further, we are unable to walk you through the completion of tax forms. Please contact an accountant or tax professional if you are uncertain of your tax obligations. The IRS states that separate reporting of these transactions is not required. However, the Form 1099-K can be used in conjunction with your other Fullscript reports and tax records to determine your correct tax. It is recommended that you follow the return instructions on the form you are completing to report your gross receipts or sales. This may differ from your 1099-K total (box 1a) since the 1099-K reports the gross ‘payment’ amount on transactions regardless of charges like sales tax and shipping, which are collected and included as part of Fullscript’s fees. * Determined by tax form requirements and instructions. You can use the fees charged by Fullscript as your cost of sales and report them as a business expense on the appropriate line item of Schedules C, E and F.
This amount should match the Net Income provided in both your Account Activity and Balance report, like in the example above, and in the 1099-K Reconciliation Report (soon to be available in Reports). This report is a listing of each sale by order number that includes the gross amount of the transaction and the resulting net income. It will also indicate the Fullscript fees charged and if there were any refunds issued. This report can be used in conjunction with the Account Activity and Balance report to determine your proper earnings for tax purposes. Fullscript will report all sales tax collected through your dispensary to the IRS. You do not need to report sales tax as a practitioner with a US dispensary. Why did I receive a 1099-K? If your “Total Gross Volume” was greater than $20,000 and 200 transactions, Fullscript will mail you a 1099-K. If you are to receive this form, you will be notified via email that the 1099-K is on its way and you may also contact us to receive a PDF copy. Why is my Fullscript 1099-K reporting a number higher than what I actually earned? Don’t worry, this is normal, and the IRS instructions for this form actually require Fullscript to report the “Total gross volume” of payments that we facilitated on your account as opposed to the net earnings. *All sales tax and shipping charges are included in the fees charged to you by Fullscript. You will not have to pay taxes on Fullscript’s fees. Why am I receiving a 1099-K and not a 1099-Misc? Fullscript is legally a third-party network payment provider, meaning we facilitate your patient’s orders by administering the transaction and organizing the delivery of products at the price you selected. So, instead of reporting that you work for Fullscript which would require a 1099-Misc, we report your pay as money earned via Fullscript and are required to report total gross volume on a 1099-K. The 1099k is typically reserved for electronic payments and payments by credit card to contractors. If a company is deemed a payment settlement entity (PSE), it is required to file a 1099k form. PSE comes in 2 forms, Merchant Acquiring Entities (example: banks) and Third-Party Settlement Organizations (TPSO). The organization’s guarantee that the provider will be paid. We believe we qualify as a TPSO as payments are captured from the practitioners customers, and distributed to the practitioners electronically through our online payment processor, Stripe. Within our Stripe account we house over 13,000 unrelated ‘connected accounts’. These accounts are associated with practitioner accounts within our application. It clearly states in our Terms of Service that we capture and settle all payment transactions, which is agreed upon by each practitioner account upon registration. These payments are captured exclusively online and through credit card. There are a clear set of standards that communicate how each payout is settled and the mechanisms to execute this exist within Stripe. There is also guarantee the practitioner will be paid upon completion of a sale further solidifying our fit to this label. What do I need to share with my tax professional to complete my taxes? The business relationship between Fullscript and your account does not require us to send any statutory CRA forms. However, the above guide will assist you in calculating your annual earnings. Should you wish to receive a T4a for your records, starting in early February Fullscript will fulfill requests to create these for illustrative purposes only. Please contact [email protected] if you wish to receive a PDF copy.